Over the last two decades virus-like particles (VLPs) have become an important tool in biomedical research and medicine. VLPs are multiprotein structures that resemble viable virus particles in conformation but lack the viral genome. Consequently, they are non‑infectious and non‑replicative, but retain the ability to penetrate cells, making them useful for a vast spectrum of applications. Above all, VLPs mimicking genuine viruses in antigenic structure provide a safe alternative to attenuated and inactivated viruses in vaccine development. Moreover, due to their transducing proprieties, VLPs may efficiently deliver foreign nucleic acids, proteins, or conjugated compounds to the organism, or even to specific cell types. Additionally, VLPs are versatile nanovectors due to their flexibility in terms of composition and expression systems. In this review, different approaches for of virus-like particle synthesis and manipulation, as well as their potential applications, will be discussed. Virus‑like particles (VLPs) are empty multiprotein structures closely resembling natural virions. Due to the absence of the genetic material, VLPs are replication‑ and infection‑incompetent. They are formed spontaneously by the self‑assembly of viral proteins during infection or by in vitro protein expression, usually in a eukaryotic system. Therefore, VLPs can be classified depending on the original virus taxonomy (e.g., adenovirus, coronavirus, etc.) or depending on the synthesis method (e.g., animal, yeast, plant, or cell-free expression). 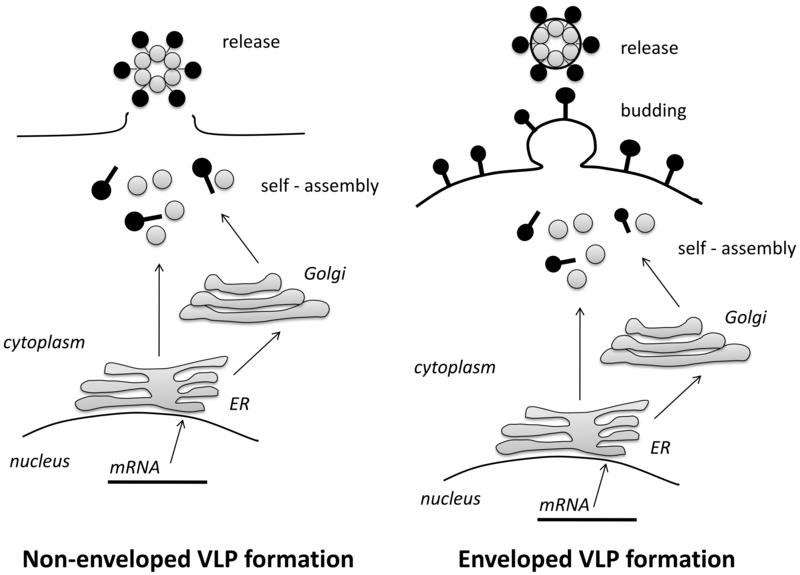 Another classification of VLPs relies on their architecture and distinguishes enveloped and non-enveloped VLPs, as well as native or chimeric VLPs. Non-enveloped VLPs are typically composed of one or more viral structural proteins, whereas enveloped VLPs consist of the host cell membrane with viral proteins displayed on the outer surface (Fig. 1) (Kushnir et al., 2012). Non-enveloped VLPs are easier to produce and purify, but enveloped VLPs are more flexible, as antigens from different pathogens can be integrated. However, they may also contain host’s proteins, which may affect downstream applications (Buonaguro et al., 2011). Fig.1 Schematic representation of the formation of non-enveloped and enveloped VLPs. Animal cells are the most convenient expression system for virus-like particles because of their ability to carry out the complex post-translational modifications that are required for proper protein folding. Genes encoding viral proteins of interest are introduced into the host cell by plasmid transfection or viral transduction (using retroviruses, lentiviruses, adenoviruses, or adeno-associated viruses for mammalian cells, or baculoviruses for insect cells). Depending on the method used, the transgene is integrated into the genome or replicates in an episomal form. The expressed viral proteins spontaneously self-assemble within the cell, as during viral infection. Mammalian (CHO, BHK, HEK-293T, COS-11 and Vero), avian (ELL-0) and insect (Lepidoptera: Spodoptera frugiperda and Trichoplusia ni) cells have been used for VLPs production in animal expression systems (Kushnir, et al., 2012). Examples of VLPs produced in animal cells and other expression systems are provided in Table I. Despite the fact that enveloped and non-enveloped, native and chimeric VLPs are efficiently formed in mammalian cells, this expression system has some limitations, including high production costs, potential safety concerns, and difficulties with scaling up production. By contrast, insect cell expression system offers significant advantages for VLPs production. Not only is this system less expensive, but it is also easier to scale up and can be used for the simultaneous expression of many proteins, facilitating the assembly of VLPs (Liu et al., 2013, Rychlowska et al., 2011). Furthermore, insect cells have the ability to post-translationally process and modify the recombinant proteins, similarly to their mammalian counterparts. Lastly, insect cells can be cultured without supplements derived from mammalian organisms, and therefore the risk of contaminating of VLPs developed for human therapy with opportunistic pathogens is minimal (Roy and Noad, 2008). Importantly, baculoviruses infect only a small group of Lepidoptera and represent no threat to humans. Yeast cells are a well‑established system for the expression of recombinant proteins. It is, however, important to remember that this system has some drawbacks that are worth considering. Yeast cells differ from mammalian cells in their post-translational modification of expressed proteins, particularly protein glycosylation pattern. For this reason, yeast is used mostly for the production of non‑enveloped VLPs. However, a number of studies have demonstrated successful self-assembly of VLPs in Pichia pastoris or Saccharomyces cerevisiae cells, and two popular vaccines licensed worldwide; against hepatitis B virus (HBV) and human papilloma virus (HPV) are based on VLPs produced in yeast. Interestingly, VLPs formation of HBV proteins has never been observed in yeast cells, but it is presumed that self–assembly takes place during the processing of the yeast biomass (Lünsdorf et al., 2011). Plant expression systems represent another option for VLP synthesis that is cost-effective, scalable, and free of mammalian pathogens. Expression of recombinant proteins in plants can be achieved either via stable or transient transfection of the transgene into the cell. Both enveloped and non-enveloped, as well as native and chimeric, plant-produced VLPs have progressed into clinical development (Scotti and Rybicki, 2013). Interestingly, plant viral vectors used for transformation such as Tobacco mosaic virus (TMV), Alfalfa mosaic virus (A1MV), Cowpea mosaic virus (CPMV), and Papaya mosaic virus (PapMV) may incorporate recombinant proteins (even if these are not of viral origin) to form chimeric VLPs. This strategy has been used to obtain prophylactic vaccine candidates against viruses HBV, influenza virus, respiratory syncytial virus (RSV), Norwalk virus (NV), bacteria (Staphylococcus aureus, Pseudomonas aeruginosa, Bacillus anthracis, and Yersinia pestis) and protozoa (Plasmodium falciparum) (Table I). Cultured cells originating from Nicotiana benthamina and N. tabaccum are widely used plant cells to generate VLPs (Scotti and Rybicki, 2013). Different expression systems for diverse virus-like particles. Chimeric VLPs are denoted with an asterix*; the exterior protein is in the first position and the scaffold protein in the second. E: enveloped, NE: non-enveloped. Bacteria, the most widely used expression system for recombinant proteins are not the host cell of choice for VLPs synthesis, due to the absence of post-translational modifications, imperfect disulfide bond formation, and problems with solubility (Zeltins, 2013). Nevertheless, bacteria are used to produce non-enveloped VLPs, often by means of a recombinant bacteriophage with foreign epitopes fused to surface proteins (Tissot et al., 2010). Another strategy relies on prokaryotic expression of viral protein in the form of insoluble inclusion bodies, followed by purification under denaturing conditions, refolding, and in vitro self-assembly (Sánchez-Rodríguez et al., 2012). Even though E. coli remains the most commonly used bacterial host for VLP production, some groups have successfully produced VLPs in Lactobacillus (Aires et al., 2006) and Pseudomonas (Phelps et al., 2007) host species. VLPs may also be formed by proteins produced in cell-free expression systems and assembled in vitro. Further modification of this approach is to incorporate expressed proteins into virosomes, which are also categorized as VLPs by some authors. Virosomes, defined as synthetic lipid or polypeptide scaffoldings decorated with viral antigens, were evaluated as vaccine candidates as early as in the 1970s (Almeida et al., 1975, Morein et al., 1979). Two examples of licensed human virosome vaccines are Epaxal and Inflexal, which are used for hepatitis A and influenza prophylaxis, respectively. The critical change in virosome production is that currently proteins of interest are expressed in a system of choice and then incorporated into a liposome or other carrier. Initially, viral antigens originated from infectious viruses, which were inactivated, dissociated, and fractionated before processing. VLPs have a broad range of potential applications due to the diversity and multigenicity of viruses. As shown with the examples provided above, these particles may be formulated not only of proteins originating from one virus species, but also of proteins from unrelated viruses or even different pathogens, i.e., bacteria and protozoa. Chimeric VLPs are of special interest as highly specific nanovectors for the delivery of antigens or therapeutic molecules. Due to their virus-like appearance and repetitive surface structure, VLPs show high immunogenicity and antigenicity. Importantly, they interact with the immune system similarly to their parental pathogens, inducing not only humoral but also cellular response, which is not common for traditional, subunit vaccines. B cell activation and the production of high antibody titers have been shown to be dependent on the conformation and epitope abundance of symmetric VLPs (Buonaguro, et al., 2011). Moreover, VLPs, as exogenous antigens, are efficiently taken up by professional antigen-presenting cells (APC), particularly dendritic cells (DC), which is followed by antigen processing and presentation by MHC class II molecules, leading to stimulation of CD4+ T helper cells. On the other hand, VLPs, similarly to native viruses, are also processed in the cytosol of DC as endogenous antigens and presented by MHC class I molecules to cytotoxic CD 8+ T cells (CTLs) (Grgacic and Anderson, 2006, Groothuis and Neefjes, 2005). This cross-presentation mechanism ensures comprehensive and strong immunological responses. Additionally, numerous VLP vaccines candidates are known to possess “self-adjuvant” properties, probably due to their particulate structure and small size of (~100 nm), which favors uptake by APC (Keller et al., 2010, Manolova et al., 2008). 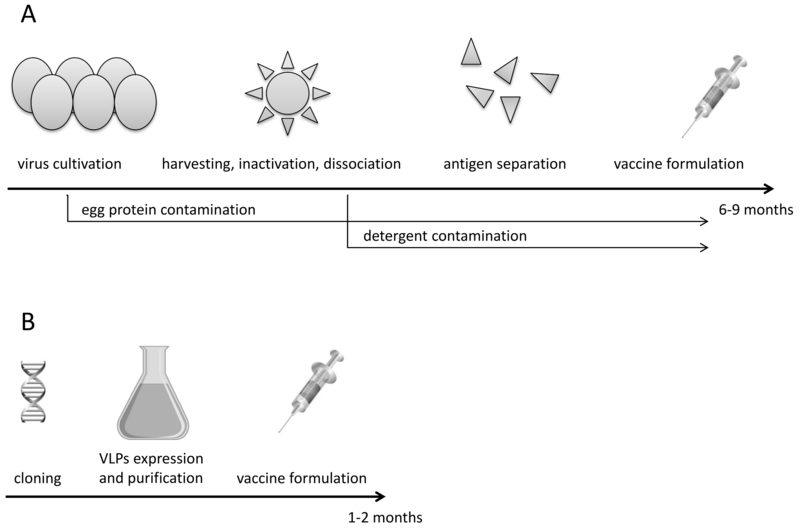 Potentially phasing-out adjuvants in VLPs vaccine formulations is unquestionably beneficial as it would both simplify the production process and increase the safety of the vaccine. Of the four VLP vaccines currently on the market, those for HBV and HPV are the best described (Buonaguro, et al., 2011) (Table II). The HBV VLPs contains virus surface antigen (HBsAg) and was the first VLPs vaccine to be generated (in 1980s) (Zuckerman, 1980, Zuckerman, 1985). Its successful production was reported in mammalian (Aden et al., 1979) yeast (Valenzuela et al., 1982), insect (Takehara et al., 1988), and plant (Mason et al., 1992) expression systems. Afterwards, HBV VLPs based on the core antigen (HBcAg-VLPs) were also developed. However, these are still in the preclinical stage of evaluation and are mainly used as a platform for the presentation of foreign epitopes from heterologous pathogens or tumor antigens (Kazaks et al., 2008). For HPV prophylaxis, VLPs are formed with L1 HPV capsid protein overexpressed in S. cervisiae or T. ni is used to prepare the licensed vaccine, but HPV VLP formation was demonstrated also in P. pastoris (Hanumantha Rao et al., 2011) and plant cells (Deleré et al., 2014; Scotti and Rybicki, 2013). The HPV vaccine, which showed 98% efficacy in protecting individuals from HPV16/18 infections (which are responsible for more than 70% of invasive cervical cancers) became a milestone in cancer prevention (Deleré, et al., 2014). As for the influenza vaccine, which must be produced de novo each year, development, production, and approval times are critical. Conventional licensed influenza vaccines are prepared from embryonated chicken eggs, inoculated individually with virus strains selected for the season. Viruses are harvested from the allantoic fluid, chemically inactivated, concentrated, and purified to remove non‑viral protein contaminants. The whole production process takes several months and is often hampered by the poor growth yield of some influenza strains (Reperant et al., 2014). Therefore, the VLP-based vaccines which are faster, cheaper and safer to obtain, represent an attractive alternative (Fig. 2). An influenza VLPs vaccine produced in insect cells was approved in US in 2013, but other influenza VLP candidates, produced in plant cells, bacteria, or cell-free systems, demonstrated as effective and safe and are currently in clinical trials (Chroboczek et al., 2014; Lee et al., 2014). Other VLP vaccines that are currently in clinical trials utilize proteins from different viruses, including respiratory syncytial virus (Glenn et al., 2013), Norwalk virus (Herbst-Kralovetz et al., 2010), human parvovirus B19 (Chandramouli et al., 2013), and P. falciparum (chimeric VLP) (Agnandji et al., 2012). VLPs vaccine candidates for human use, that were shown to be immunogenic in animal models but are still under preclinical investigation include: human immunodeficiency virus (HIV-1), severe acute respiratory syndrome coronavirus (SARS-CoV), hepatitis C virus (HCV), RSV, rotavirus (RV), dengue (DENV), rabies (Kushnir, et al., 2012; Roldão et al., 2010), and others. Veterinary vaccinology is a distinct, broad field, which will not be discussed in this review, but VLPs have also been investigated as vaccine candidates for animal use (Liu et al., 2012). As mentioned above, the plasticity of VLPs enables the formulation of chimeric vaccines loaded with heterologous antigens. This can be achieved either by co-expression of structural proteins of different viruses or by gene fusion, and results in foreign epitopes displayed on the external surface of the VLPs. The first strategy can be illustrated by the SARS‑CoV VLP, where SARS spike protein is incorporated into an influenza matrix 1 protein scaffold, overcoming the problem of low yield in the production of the native SARS VLPs (Liu et al., 2011). Using the second approach the synthesis of particles that do not form native VLPs at all, becomes feasible. An anti-malaria vaccine, currently in clinical trials, is an example of a VLP displaying a non-viral antigen (S protein of P. falciparum) that is expressed as a fusion partner with HBsAg (Agnandji, et al., 2012). Alternatively, VLPs may be engineered to modulate the immune response by conjunction of adjuvants or stimulatory molecules such as Toll-like receptors (TLR) ligands and T-cell epitopes. For example, VLPs containing CpG motifs, a ligand for TLR-9, have significantly improved anti-HPV VLP humoral responses in the peripheral blood and in genital mucosal secretions in animal models (Gerber et al., 2001; Hjelm et al., 2014). Similarly, HIV VLPs equipped with cholera toxin subunit B showed increased stimulation of mucosal cellular response (Kang et al., 2003; Ludwig and Wagner, 2007). Another VLP developed to co-deliver interleukin-2 resulted in robust cytotoxic T-lymphocyte activation (Juarez et al., 2012; Oh et al., 2004). In addition to enhancing the immune response, including immunity potentiators, improves the pharmaco-kinetic profile of, VLPs reducing nonspecific binding to serum proteins. Vaccines for non‑infectious diseases are an interesting application for chimeric VLPs, which are designed to induce specific antibodies directed against self-antigens and thus boost humoral immunity. These VLPs carry antigens typical for cancer (melanoma), neurodegenerative diseases (Alzheimer’s disease), autoimmune diseases (allergic rhinoconjunctivitis and asthma) and other disorders (Table III). Most therapeutic VLP vaccines are based on the bacteriophage Qβ, which is highly expressed in E. coli, enabling the development of an economical large-scale production process. Importantly, during self-assembly, bacteriophage Qβ packages host-derived RNA (the natural ligand for TLR7 and TLR8), thus activating antigen-specific IgG2a responses (Bachmann and Jennings, 2011). The remarkable and unique advantage of VLPs as delivery vehicles is theirs specificity, which results from the receptor-mediated transduction mechanism. Similar to native viruses, most VLPs target and penetrate different cell types depending on receptors exposed at their surface. As a consequence, the diverse tropisms of parental viruses provide a range of natural targeting capabilities for VLPs, without the need for further modifications (Seow and Wood, 2009). Decorating VLPs with foreign molecules may be achieved by various means, including genetic manipulation, non-covalent interactions, or chemical coupling of different compounds. Physical encapsulation of organic and non-organic moieties has been described as well and consists of the disassembly of purified VLPs (by osmotic shock, use of chelating agents, or varying the pH) and reassembly in the presence of the desired molecule. Table IV summarizes VLPs packaging methods and examples of cargo molecules that have been successfully delivered to target cells. Delivering drugs into target cells is particularly important for anti-proliferation chemotherapeutics, where systemic administration causes undesired side-effects. Therefore, specific carriers, such as VLPs, are of significant interest in this field. Successful transfer of VLPs packaged with anticancer agents was described for bleomycin (BLM) and doxorubicin (DOX). Both conjugates were chemically coupled to VLPs (BLM to adenoviral VLPs and DOX to RV VLPs) and have demonstrated improved drug bioavailability and growth inhibition of targeted cancer cells (Zhao et al., 2011; Zochowska et al., 2009). The ability to bind nucleic acids is common for viral structural proteins and is used to pack oligonucleotides and plasmids (as well as other negatively charged substances) into VLPs (Zeltins, 2013). DNA-loaded VLPs were developed for gene therapy and aroused great hope as potential specific carriers of nucleic acids (Petry et al., 2003, Ramqvist et al., 2007). Successful expression of β-galactosidase, encoded by a plasmid delivered by a polyomavirus VP1 VLP to different tissues, demonstrated the feasibility of the VLP-mediated gene therapy concept (May et al., 2002). Up to 17 kb of DNA may be packaged into an SV40 polyoma VLP, as reported by Kimchi-Sarfaty (Kimchi-Sarfaty et al., 2003), but the theoretical capacity of larger VLPs is probably higher. In subsequent years, the increasing interest in use of modified small interfering RNAs as therapeutics resulted in further studies on VLPs as delivery vessels for these molecules (Seow and Wood, 2009). For example, treatment of lupus-prone mice with bacteriophage MS2 VLPs loaded with miR-146a miRNA – a recognized gene silencer – inhibited the production of auto‑antibodies and inflammatory cytokines (Pan et al., 2012). Protein delivery by VLPs has been described for heterologous antigens, antibodies, cytokines, enzymes, and reporter proteins such as green fluorescent protein (GFP) or maltose binding protein (MBP). Cargo proteins are usually tethered to the external surface of the VLP by genetic fusion to structural VLP protein or by exploiting natural interactions between the transported protein and structural proteins present in VLPs (antigen-antibody interactions, ligand-receptor interactions, inter-domain interactions etc.). Conjunction of Herceptin, an antibody directed against a mutated version of the tyrosine kinase receptor HER2 to the polyoma VLP is a good illustration of the potential use of VLPs in directed cancer immunotherapy (Gleiter and Lilie, 2003). Another example of a protein targeting ligand is epidermal growth factor (EGF), which was incorporated into SV40 polyoma VLPs, that selectively transduced cells overexpressing the EGF receptor (Kitai et al., 2011). Labeling VLPs with fluorophores is another way of tethering foreign substances to these nanovectors but also a powerful research tool. Fluorescent VLPs can be traced within host cell, tissue, or organism. Viral particles can be labeled by covalent or non-covalent chemical methods or by fusion of fluorophores to proteins integrated into the viral particle. Chemical methods consist of inserting fluorescent dyes into the viral membrane. Alternatively, attachment of streptavidin-coupled fluorophores can be achieved by biotinylating target structures of interest (Wojta-Stremayr and Pickl, 2013). The feasibility of encapsulating metal nanoparticles within the VLP cavity was shown by packaging adenovirus (AdV) VLPs with nanogold molecules (Fuschiotti et al., 2006). Recently, an interesting application for another functionalized VLPs has been described providing proof of concept for the use of VLPs for diagnostic purposes. Cowpea chlorotic mottle virus (CCMV) VLP loaded with Gd3+ ions or HBcAg-VLPs loaded with Fe3O4 serve as paramagnetic high contrast agents for magnetic resonance imaging (Mateu, 2011, Shen et al., 2014). Even though VLPs seem to be universal delivery platforms, they do possess several limitations, especially to their use as gene or drug carriers. The most challenging problem concerns the pre-existing immunity in most individuals for common viruses. A solution proposed to overcome undesirable immunogenicity of VLPs consists of modifying them with immune masking agents, such as polyethylene glycol (PEG), which has been shown to suppress the primary antibody response (Jain and Jain, 2008). Another concern that must be kept in mind is that like any virus-based treatment, VLPs are not suitable for repetitive administration. The exception here is cancer immunotherapy, where the goal is to stimulate tumor recognition in an escalating manner. Initial enthusiasm for VLP-mediated gene therapy has been tempered by the lack of large-scale methods for adequate internalization and proper release of the desired nucleic acid, and further research will be necessary to overcome this problem (Pattenden et al., 2005). It is also worth noting, that the different mechanism of assembly of non-enveloped and enveloped VLPs impede in vitro encapsulation of foreign molecules in the latter. Virus-like particles have been produced for a wide range of taxonomically and structurally distinct viruses and have unique advantages in terms of construction flexibility. Moreover, their versatility relies on their unique structural diversity and tailorable functionality. 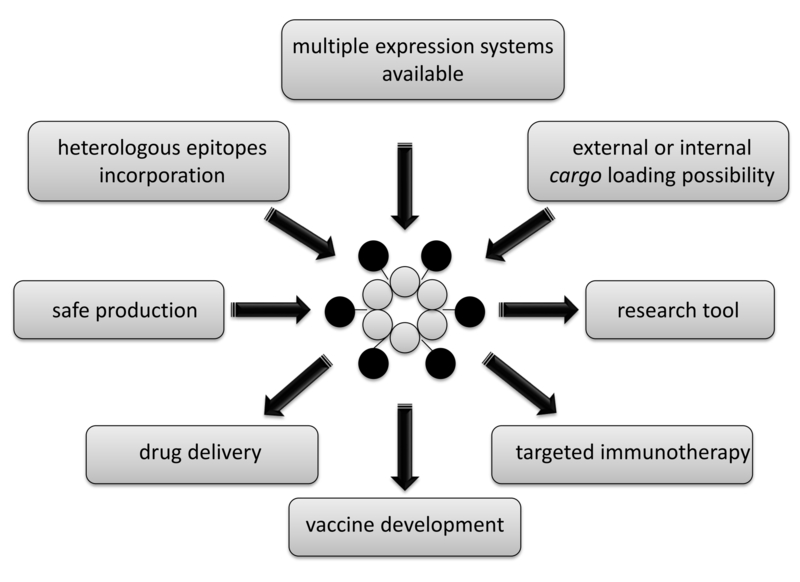 Potential uses of VLPs include vaccine production, vectors for gene therapy and targeted drug delivery, and molecular imaging tools (Fig. 3). However, translation from preclinical research to licensed products requires extensive studies in animal models that remain to be completed. Firstly, effective and scalable loading of cargo onto VLPs vectors requires further investigation. Futhermore, careful evaluation of the toxicity, biodistribution, stability in vivo, and clearance of VLPs will be crucial in order for these nanocarriers to be considered for medical use. Fig. 3 Diagram showing possible VLP applications.